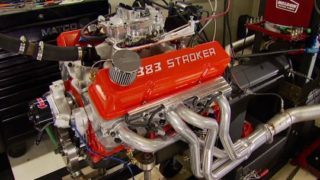 (ANNOUNCER)>> DIRT TRACK RACING IS HOTTER THAN EVER, AND TODAY'S HORSEPOWER IS ALL ABOUT BUILDING A HIGH REVVING FOUR BANGER RACE ENGINE. YOU'LL BE BLOWN AWAY AT HOW MUCH POWER YOU CAN GET FROM THIS TWO POINT THREE LITER ROCKET! SPRINTS TO LATE MODELS. DRIVERS COME FROM ALL WALKS OF LIFE, AND IN ALL AGES AND SIZES. LOGAN BROWN'S ONLY 13 YEARS OLD AND RECENTLY STEPPED UP TO THE MINI MODIFIED CLASS. A COOL CLASS WITH FEWER RULES THAN MANY OTHERS. HIS NEW NUMBER 10 CAR'S POWERED BY AN ESSLINGER 2,300cc ENGINE LIKE THE ONE WE'LL BUILD TODAY ON OUR SHOW. SO HOW DID IT FEEL COMPARED TO THE MINI SPRINT HE USED TO DRIVE. A LOT OF LEARNING EXPERIENCES WITH IT. FOR MORE THAN 30 YEARS. 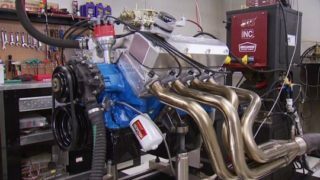 THEY'VE DEVELOPED AND REFINED A SINGLE OVERHEAD CAM ENGINE THAT POWERS EVERYTHING FROM DRAG RACERS TO, WELL MINI MODIFIEDS LIKE LOGAN'S CAR. ESSLINGER ENGINEERING MADE ABOUT 90 PERCENT OF THE PARTS HERE YOU SEE THAT WE'RE GONNA USE TO BUILD OUR OWN FOUR BANGER RACE ENGINE. AND WELL, DAN'S THE MAN WHO RUNS THE COMPANY, GREW UP IN THE BUSINESS. WHAT KIND OF THOUGHT PROCESS GOES INTO BUILDING AN ENGINE THAT CAN RUN 8,000 RPM'S FOR HOURS? (DAN)>> WELL YOU FIRST HAVE TO START WITH THE BELIEF THAT WHATEVER PROBLEM COMES UP YOU CAN SOLVE IT. SO MECHANICALLY WHEN THINGS GO WRONG YOU LOOK FOR WHAT'S, WHERE THE AREA IS THAT'S FAILING AND YOU FIX IT. THEN MOVE TO THE NEXT AREA THAT FAILS. (JOE)>> WELL HE MORE THAN FIXED IT. HE REDESIGNED MOST OF IT, FROM THE CRANK AND RODS, ONTO THE ALUMINUM HIGH PERFORMANCE HEADS. HE EVEN CAST HIS OWN MODIFIED TWO POINT THREE LITER BLOCK FOR THE ENGINE. WELL INTERESTINGLY ENOUGH, THE COMPONENTS OF THIS RACE ENGINE HAVE THEIR ORIGINS IN A PRODUCTION MOTOR THAT POWERED VEHICLES, WELL LIKE YOUR DAD MIGHT HAVE DRIVEN. 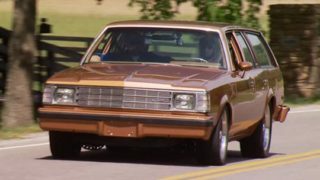 (MIKE)>> ARCHITECTURALLY IT'S THE SAME TWO POINT THREE LIMA ENGINE FORD PRODUCED FOR SEVERAL OF ITS VEHICLES FROM 1974 TO 1997. NOW WE'VE GOT THIS ONE IN HERE JUST TO SHOW YOU ITS MAKE UP. 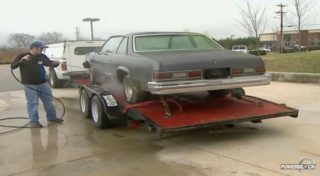 NOW IT CAME TO US FROM A NATION WIDE COMPANY CALLED LKQ WHO SPECIALIZES IN USED AND REBUILT AUTOMOTIVE PARTS. NOW "LIMA" IS NAMED AFTER THE LIMA, OHIO, FORD PLANT. 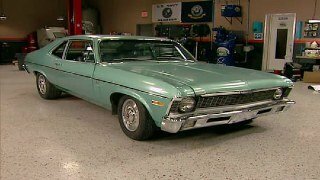 IT CAME IN SEVERAL DIFFERENT CONFIGURATIONS, FROM CARBURETED SETUPS, EFI LIKE THIS, EVEN INTERCOOLED AND TURBOCHARGED ENGINES. THIS ONE CAME OUT OF A '93 RANGER PICK UP. IT'S 140 CUBIC INCHES AND HAS TWO PLUGS PER CYLINDER. PLUS IT'S A DISTRIBUTORLESS IGNITION SYSTEM. 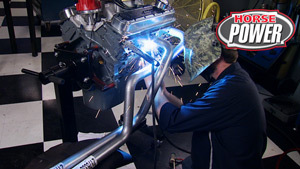 WE'LL START THE TEAR DOWN BY REMOVING THE EGR TUBE THAT CONNECTS FROM THE FACTORY TUBE HEADER TO THE THROTTLE BODY ELBOW, FOLLOWED BY THE ELBOW ITSELF. THE INTAKE MANIFOLD IS ALUMINUM AND HOUSES THE INJECTORS, FUEL RAILS, AND SEVERAL SENSORS. WITH THAT REMOVED WE CAN SEE THE DSHAPED INTAKE PORTS FOR THIS TRUCK HEAD. IN '83 THROUGH '85 THESE WERE ROUND. SOME OF YOU MAY HAVE HAD ONE OF THESE LIMA ENGINES IN THE PAST THAT ONLY HAD ONE PLUG PER CYLINDER. WELL THE SECOND ONE IS TO INCREASE THE SPEED OF COMBUSTION BY PROVIDING TWO FLAME FRONTS. IT MAKES FOR A MORE COMPLETE COMBUSTION CYCLE, BETTER EMISSIONS, AND REDUCES THE POSSIBILITY OF DETONATION. LIMA ENGINES FEATURE A MORE MODERN OVERHEAD CAM DESIGN. IT DOESN'T USE PUSH RODS. SO THE LACK OF GIVES A REDUCTION IN VALVETRAIN WEIGHT FOR MORE STABILITY AT HIGHER RPM'S. ROLLER CAM FOLLOWERS AND HYDRAULIC VALVE LASH ADJUSTORS MAKE UP THE VALVETRAIN COMPONENTS. BEHIND THE TIMING COVER A COG STYLE BELT IS TURNED BY THE CRANK, WHICH ALSO TURNS THE OIL PUMP, RIDES AGAINST THE TENSIONER, AND FINALLY TURNS THE CAM SHAFT. NOW LOOSEN THE TENSIONER, REMOVE THE ACCESSORY BELT PULLEY, THE CRANK SENSOR RELUCTOR HUB, THE SENSOR, ITS BRACKET, AND THE TIMING BELT. NOW THE OIL PUMP PULLEY HAS TO GO TO MAKE WAY FOR THE BACK HALF OF THE TIMING BELT COVER. THE FRONT CAM BOLT ALSO DOUBLES AS AN OIL GALLERY PLUG. NOW THE CAM IS OILED FROM AN LOWER AND AN UPPER HOLE IN THE CAM TOWERS. THEN OIL IS FORCED THROUGH THE CORE OF THE CAM TO EACH INDIVIDUAL LOBE WHERE A SMALL HOLE OILS THE ROLLER AND THE FOLLOWER AS WELL AS THE REST OF THE VALVETRAIN COMPONENTS UP TOP. WAS IT EFFECTIVE? AND THAT WAS JUST TURNING IT BY HAND. FINALLY WE CAN REMOVE THE OIL PUMP DRIVE COMPONENTS. NOW YOU KNOW THE BASIC LOWDOWN ON LIMA ENGINES. NEXT YOU'LL SEE HOW TO BUILD A HIGH PERFORMANCE VERSION FOR RACING AT 8,000 RPM. (DAN)>> THE CYLINDER WALLS ARE MUCH THICKER AND SIAMESED MAIN WEBS ARE HEAVIER. AND THEN WE BUILT IT OUT OF BETTER MATERIAL. ON ALL LEVELS IT'S QUITE A BIT STOUTER THAN WHAT WE STARTED WITH. HANDLE SOME ABUSE, BUT IT DOES HAVE ITS LIMITATIONS, LIKE SMALL COUNTER WEIGHTS, WHICH CAN RESTRICT HOW FAST YOU CAN TURN THIS THING IN THE RPM RANGE. OVER DO IT AND YOU'RE GONNA HAVE SOME MESSED UP MAIN BEARINGS. NOW THE ESSLINGER CRANK IS CONSTRUCTED OUT OF BILLET STEEL. THIS THING WEIGHS IN AT 38 POUNDS AND IT'S BUILT IN HOUSE. IT HAS A THREE/THREE FIFTY STROKE, AND IT CAN HANDLE 10,500 PLUS RPM'S AND 1,200 HORSEPOWER. WE'RE LAYING IT DOWN ON LUBED UP COATED CLEVITE BEARINGS. NOW WE CAN SLIDE ON THE REAR MAIN SEAL AND THE BEEFIER, STRONGER ESSLINGER CAP, AND LUBE THE ARP STUDS WITH ULTRA TORQUE LUBE. WE'LL TORQUE THE MAINS IN THREE STEPS, 30, 60, AND 90 FOOT POUNDS. I WISH YOU FEEL HOW SMOOTH THIS TURNS. ARE A LIGHT FORGING WITH FLAT TOPS, DUAL VALVE RELIEFS, AND VERTICAL GAS PORTS. NOW WE LOADED OURS UP WITH LOW TENSION TOTAL SEAL RINGS. ESSLINGER ALSO MAKES THE IBEAM CONNECTING RODS. LENGTH, AND MADE OF 4340 BILLET STEEL. (MIKE)>> THERE SHE IS. ANOTHER WEAK LINK IN THE TWO POINT THREE WAS THE FACTORY AUXILIARY SHAFT. NOW THIS THING IS MADE OUT OF CAST AND IT WAS PRONE TO BREAKAGE RIGHT IN FRONT OF THE JOURNAL. NOW THE ESSLINGER PIECE, IT'S MADE OUT OF BILLET, HAS A DRIVE FOR THE FUEL PUMP, AND IS ABOUT 400 PERCENT STRONGER. (JOE)>> THE OIL PUMP RIDES ON A NEEDLE BEARING AND THAT ALLOWS BETTER OILING TO THE FRONT MAIN SINCE IT DOESN'T GET LUBED BY PRESSURIZED OIL ANY MORE. CYLINDER BOLTS OR STUDS. THESE ENGINES NATURALLY CREATE A LOT OF VIBRATION AND IT WILL LOOSEN THE FASTENERS. LOCTITE KEEPS THEM IN PLACE. WITH THE OIL PUMP DRIVE IN PLACE WE CAN BOLT A MELLING HIGH VOLUME PUMP TO THE BLOCK, AND THIS CANTON PICK UP WILL GUARANTEE WE ARE AT THE RIGHT DEPTH IN THE SUMP. THE BILLET ESSLINGER TIMING COVER CAN GO ON NEXT FOLLOWED BY THE FIVE AND A HALF QUART CANTON OIL PAN. NOW IT'S DESIGNED FOR LEFT TURN CIRCLE TRACK RACING WITH THREE TRAP DOORS AND A BUILT IN CRANK SCRAPER. IT'LL CLEAR STOCK STARTERS AND IT FITS FOX BODY MUSTANGS, PINTOS, AND MINI MODIFIEDS. NOW FIRST THING TO GO ON IN FRONT IS THE AUXILIARY SHAFT SEAL COVER. THEN THE ESSELINGER WATER PUMP FOLLOWED BY THE TIMING BELT COG DRIVE ON THE FRONT OF THE CRANK AND THE PULLEYS WITH THE BELT LOOSELY ATTACHED. HERE'S OUR STOCK CAST IRON HEAD NEXT TO THE NEW ALUMINUM SVO WE'RE USING. 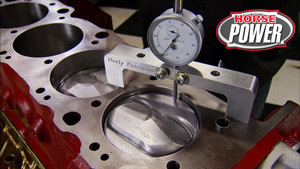 MAJOR DIFFERENCES ARE THE SVO'S LARGER VALVES AND SMALLER COMBUSTION CHAMBERS. (JOE)>> ESSLINGER NOT ONLY DESIGNED THIS SVO HEAD, THEY MACHINE IT IN HOUSE WITH LARGER INTAKE RUNNERS THAT ARE DESIGNED FOR A BETTER SHOT AT THAT VALVE. NOW WHEN A GUY ORDERS ONE HE GETS HIS CHOICE OF CAM PROFILE AND OTHER COMPONENTS. AND WELL THESE THINGS HAVE TURNED OUT TO BE REALLY POPULAR WITH MIDGET RACERS, HYDRO PLANES, OFF ROAD TRUCKS, AND IN OUR CASE OF COURSE CIRCLE TRACK RACING. IT'LL SIT ON A FEL PRO GASKET WITH A 51 THOUSANDTHS COMPRESSED THICKNESS. WITH THE FLAT TOP PISTONS AND 40cc COMBUSTION CHAMBERS, THE COMPRESSION RATIO'S GONNA BE 12 AND A HALF TO ONE. ARP STUDS WILL HOLD THE HEAD IN PLACE WITH THE SAME 30, 60, AND 90 FOOT POUND TORQUE SEQUENCE WE USED ON THE MAIN. (MIKE)>> ANOTHER TRICK PIECE ON THE HEAD ARE THESE LASH CAPS DAN'S FATHER DESIGNED. THEY ACCOMMODATE MORE LIFT BY ADDING A RADIUS TIP. HIS DAD EVEN INVENTED THIS TOOL TO INSTALL THE FACTORY FOLLOWERS, AND HAVE BEEN PROVEN TO LAST IN EXTREME RACING CONDITIONS. 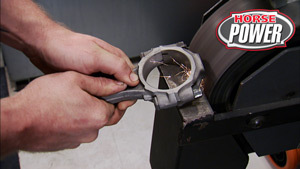 THESE MOUSE TRAP CLIPS ACT AS A NOISE SUPPRESSOR WHEN RUNNING A SOLID LIFT CAM SHAFT. THIS NEXT STEP IS PRETTY INTERESTING. FOR ALL YOU VEIGHT GUYS THAT USE MAGNETIC BRIDGES, DIAL INDICATORS, AND DEGREE WHEELS TO TIME YOUR ENGINES, THROW ALL THAT STUFF AWAY WHEN TIMING ONE OF THESE. NOW DAN LIKES TO USE WHAT HE CALLS AN EBAR. YOU PLACE IT ON THE FRONT TWO LOBES OF THE CAM SHAFT AND ROTATE THE CAM SHAFT UNTIL THE EBAR IS FLAT AND LEVEL WITH THE CAM TOWER. ONCE THAT'S DONE, WE KNOW THAT THE CAM SHAFT'S ON TDC. NOW WE CAN COME DOWN TO THE CRANK, ROTATE IT TO TDC ON THE POINTER, AND ROUTE THE BELTS AROUND THE TENSIONER AND ONTO THE PULLEY. I GAINED A LOT OF RESPECT FOR THIS LITTLE ENGINE AND THE PARTS DAN DESIGNED FOR IT. IT'S ON TO THE DYNO NEXT. 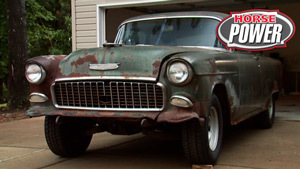 (MIKE)>> WE'RE BACK AND CONTINUING OUR FIRST FOUR CYLINDER ENGINE PROJECT. 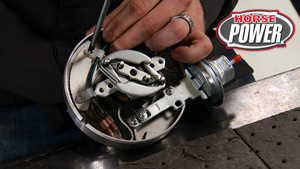 EVERY MODIFICATION WAS DESIGNED FOR CIRCLE TRACK RACING, INCLUDING THE CAM. NOW IT HAS A BROAD POWER AND TORQUE BAND THROUGH THE ENTIRE RPM RANGE. IT'S A SINGLE PATTERN WITH 620 LIFT, A 111.5 LOBE SEPARATION, AND DURATION AT 50 IS 269. AND WE'LL COVER IT ALL WITH THIS CAST ALUMINUM VALVE COVER FROM ESSLINGER. TO MOUNT TO THE DYNO WE GOT A BELL HOUSING ADAPTER FROM CANFIELD INDUSTRIES. 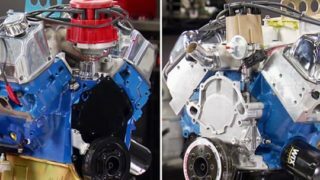 IT CONVERTS THE TWO POINT THREE BOLT PATTERN TO THE THAT OF A FIVE LITER FORD. WE ALSO HAD AMERICAN POWERTRAIN MACHINE A CUSTOM FLYWHEEL WITH A TWO POINT THREE CRANK PATTERN BUT A FIVEO PRESSURE PLATE PATTERN FOR OUR DRIVE FLANGE. INSIDE THE DYNO IN GOES 6 QUARTS OF KLOTZ 15/50 RACE ENGINE BREAKING OIL. IT'S DAN'S CHOICE FOR ALL HIS BUILDS. THE INTAKE IS ANOTHER ONE OF DAN'S DESIGNS HE'S PROUD OF. AND LIKE MOST OF HIS PARTS, MADE IN HOUSE AND IN THE USA. (DAN)>> MY DAD DID HIS TIME IN THE SERVICE AND WAS A FIRM BELIEVER IN EVERYTHING AMERICA AND AMERICAN IS BETTER. RACING STARTED HERE, SO I DON'T KNOW WHY WE'D TAKE IT ANYWHERE ELSE IF WE DIDN'T ABSOLUTELY HAVE TO. (DAN)>> ACCORDING TO THAT IT'S DEAD RICH. (MIKE)>> WE FINALLY GOT A RUN IN THE BAG BUT THERE'S A SMALL ISSUE. THAT THIRD CYLINDER IS STILL ICE COLD. (DAN)>> THAT'S WHAT WE'RE GONNA SEE UNTIL WE PUT THAT BAFFLE ON IT. TWO AND FOUR ARE RUNNING THE RIGHT TEMPERATURES. ONE AND THREE ARE PRETTY COLD. BASICALLY ALL THE FUEL'S GOING DOWN ONE AND THREE. JAMIE MILLER, OUR CYLINDER HEAD GUY AND I SPENT ABOUT THREE DAYS ONE TIME COMING UP WITH THIS BAFFLE THAT WE PUT IN THE INTAKE MANIFOLD TO KINDA REDIRECT THE FUEL AND EVEN OUT THE FUEL FLOW TO EACH CYLINDER. TYPICALLY IT GOES IN AND THE EXHAUST TEMPERATURES GET MORE EVEN, WE CAN JET A LITTLE MORE AGGRESSIVELY, MAKE A LITTLE MORE POWER. SO I'M GONNA THROW THIS IN AND SEE WHAT HAPPENS. (MIKE)>> BAFFLED, YOU WON'T BE. DAN'S A MASTER AT FINDING HORSEPOWER IN HIS MODIFIED TWO POINT THREES, STAY WITH US. (MIKE)>> WE'RE BACK, ALONG WITH DAN ESSLINGER, TUNING ONE OF HIS MODIFIED TWO POINT THREE RACE ENGINES. NOW HE'S USING AN INTAKE BAFFLE TO EQUALIZE FUEL DELIVERY MONITORED BY CYLINDER HEAT. NUMBER ONE AND NUMBER THREE WERE THIRSTY. THREE AND FOUR! (DAN)>> FOUR GOT REALLY HOT. (MIKE)>> REAL HOT YEP! NOW FLOW BENCH REQUIRED, JUST EXPERIENCE PLAIN AND SIMPLE. (MIKE)>> CYLINDER FOUR LEVELED OUT BUT AT THE EXPENSE OF THREE. ONE MORE MINOR TRIM. IT GOT A LOT BETTER EVERYWHERE. (MIKE)>> EVERYTHING'S WITHIN FIVE DEGREES EXCEPT NUMBER THREE HOLE. (DAN)>> IT'S ONLY 100 OFF. TIMING AND TAKING THE RUN TO 7,500 RPM'S. 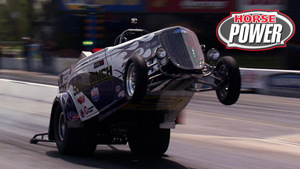 (MIKE)>> THIS TURNED OUT TO BE THE LONGEST DYNO SESSION I EVER HAD THE PRIVILEGE TO BE A PART OF. SEVERAL TIMING CHANGES LED TO MULTIPLE CAM ADJUSTMENTS. (DAN)>> HEY, WE FOUND SOMETHING IT DOESN'T LIKE. 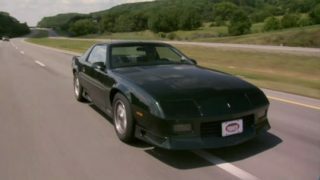 (MIKE)>> YEAH, IT DOESN'T LIKE ANY RETARDED TIME IN IT. DAN KNOWS WHAT'S IN THERE AND HE'S GOING TO FIND IT. (DAN)>> YOU GOTTA TRY TO UNDERSTAND WHAT'S GOING ON INSIDE OF THINGS. WHAT'S GOING ON INSIDE THE PLENUM? WHERE'S THE FUEL GOING, WHERE'S THE AIR GOING? WHAT DOES IT NEED? WHAT'S IT GONNA DO ON THE RACE TRACK? WE COULD CHASE BIG NUMBERS BUT BIG NUMBERS DON'T NECESSARILY WIN RACES. YOU'VE GOT TO HAVE SOMETHING THAT RUNS THROUGH A WHOLE RANGE. WHEREVER THEY'RE GONNA BE GIVING IT GAS THE THING'S GOTTA RUN. WE TRY TO WEAR THEM OUT ON THE DYNO A LITTLE BIT JUST TO BE SURE WE KNOW WHERE THEY'RE AT. I'D RATHER DO A LITTLE MORE HERE THAN MAKE THE CUSTOMER FIGURE IT OUT. (DAN)>> THAT'S THE BEST NUMBER YET. 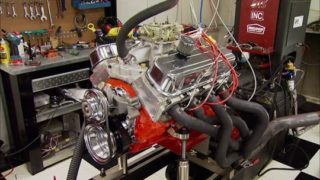 (MIKE)>> THE NEXT CHANGE WILL BE TO THE CARB, INSTALLING A POWER VALVE BLOCK OFF, WHICH WILL REQUIRE LARGER JETS. SO BACK TO THE '80'S. 262, 203, AIR/FUEL'S NOT GONNA GET ANY BETTER THAN THAT UP TOP. DROP DOWN ONE JET SIZE. (MIKE)>> 268 HORSEPOWER, 211 FOOT POUNDS OF TORQUE. (DAN)>> I THINK YOU WIN SOME RACES WITH THAT. (DAN)>> WELL IT'S ALL ABOUT WINNING. AT THE END OF THE DAY THERE'S A RACE TO GO TO. ALL WE CAN DO IS DO OUR BEST AND TRY AND MAKE SOMETHING THAT MEETS THEIR NEEDS AND GETS THEM UP FRONT, GIVE THEM A CHANCE TO WIN SOMETHING.